The clearest image we have of the houses is the one shown on the left which we think shows 41 and 43 St Mary Street. 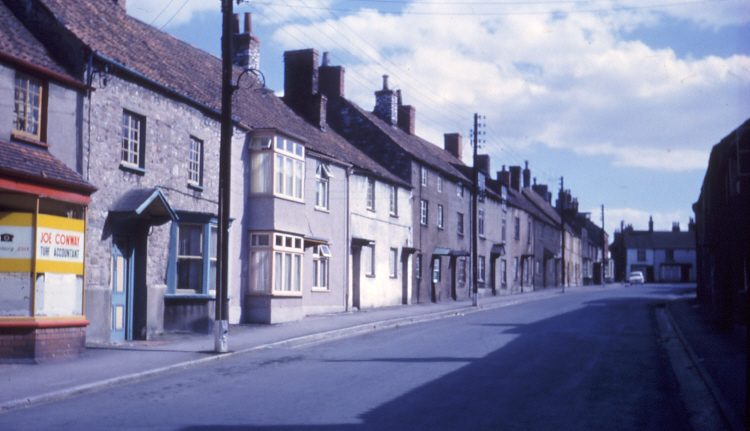 It is taken from a photograph of the street taken about 1961 just before the houses were demolished. Click on the thumbnail shown on the right below to see the full image. We would love to hear from anyone who has any other photos! We are grateful to South Gloucestershire Council who allowed us to copy the deeds of this and adjoining properties in St Mary Street and Rock Street. The records show that 41 St Mary Street was ‘the new house was built just before 1785 by Richard Williams on a site where a old house formally stood and which when standing was occupied by John Mills’. Several of these documents tell us some more about the people associated with the house before Richard Williams re-built it. John and Sarah Barton – an indenture dated 30th May 1719 (which relates to the house next door) shows that 41 St Mary Street had been occupied formerly by Margery Barton alias Huggins, and then Margery Jones. According to a schedule of deeds in an Abstract of Title dated 1856 (which relates to the part of the garden facing Rock Street which was sold off) on 27th November 1727 Sarah and John Barton sold 41 St Mary Street (to Charles Hudd). In the will of Charles Hudd (see below) he refers to Jonathan Barton as being a yeoman and that he and Sarah appeared to have a son, John Barton. Charles and Mary Hudd – having acquired the property in 1727, Charles died shortly after. His last will and testament dated 26th April 1729 shows that Charles was a brazier. He refers to the property in the Back Street in which he was living and which he bought from Jonathan Barton, plus ‘a piece of ruinous ground’ nearby which he purchased from Sarah Barton, a widow. He left this property with all gardens, orchards etc for the use of his wife Mary during her life or expiration of her widowhood and then it was left to the use of their daughter, Patience who was the wife of John Mills and after her death or to their grand-daughter, Elizabeth Mills. The will also refers to another property in Back Street which Charles had bought from Guy Hewett. This was also left to Mary subject to the same conditions as above and then the property with gardens orchards backsides etc was left to their daughter, Charity Hudd. It is interesting to see from the will that Charles and Mary had two sons, Charles and William who were only left one shilling each in the will so we assume that they were provided with property in some other way. Their daughter Mary was also left one shilling. Charles’s widow, Mary, was still noted as being in the house in 1740. We note that there is a possible burial of Mary Hudd on 16th October 1746. We also have a copy of the last will of the son, Charles Hudd who died in 1758. He had married Elinor Powell on 16th February 1713. He was also a brazier and had three children: Joseph, Betty and Mary. We think that Mary married John Thurston as he is referred to in the will as being Charles’s son-in law. John and Patience Mills – several documents show that John Mills, a labourer, was living in the property in 1757. John’s wife Patience inherited the property from her parents, Charles and Mary Hudd (see above). According to the Abstract referred to above, on 1st and 2nd March 1768 John Mills and Patience his wife sold the property to Richard Williams. Patience died aged about 79 and was buried on 26th November 1775. John must have died previously as she is noted as being his ‘relict’. In his will Richard left this property to his wife Mary during her lifetime or widowhood, and then left it to his son, Richard Williams. It was described as a newly erected house with a garden and orchard in the occupations of Robert Wiltshire and John Tilly. On 15th August 1817 Mary and her son, Richard a carpenter, then living in Over near Almondsbury, sold part of the garden (approx 4 perches) facing Rock Street for £18. The land was being rented out by Mary Williams to William Herbert. The new owner was William Cowley and the purchase allowed him to build a house on part of the land. This house later became known as 10 Rock Street. Elizabeth Johnson – on 27th November 1820 Elizabeth bought the property from Mary Williams and her son, Richard, both living in Over, Almondsbury for £105. Elizabeth was described as a spinster of Thornbury. Elizabeth was the sister of Thomas Johnson of Elberton who had married Martha Cullimore in 1804. Thomas owned a considerable amount of land in the area around Thornbury and left Elizabeth £100 in his will dated 1828. Elizabeth is shown in the 1809 and 1810 land tax records and 1809 rent roll as a tenant of the house which stood where Rosemount now stands at the top of the High Street. In 1813, she was living at 55 High Street, according to an indenture relating to an adjoining property. In her will dated 14th November 1831 she referred to land she owned in Littleton on Severn and to the house in which she lived in Thornbury, which we believe to be 55 High Street (the house where she was living at the time of her death). She left these properties in trust to her niece, Martha Ward (wife of Alfred Ward of New Leaze, Olveston) and after her decease to Martha’s son, Thomas Johnson Ward. In her will Elizabeth also referred to 41 St Mary Street, the house she had bought from Richard and Mary Williams. She originally left the two rooms on the ground floor (formerly occupied by Martha Walker widow deceased) and the bedroom (now occupied by Prudence Rugman) and a half part of the back kitchen and half the garden to Sarah Jenkins, the daughter of Elizabeth’s kinswoman, Hannah Jenkins (the wife of William Jenkins of Morton). She left the remainder of the house to Betty Binden widow. However in a codicil written on the 8th March 1834 she changed her mind and left the whole property to Betty Binden. We don’t know when Elizabeth died, but it must have soon after making the codicil as Betty Binden arranged a loan using the house as security on 30th September 1834. Elizabeth (Betty) Binden – Elizabeth Roberts was born about 1785 in Littleton. On 18th April 1815 she married Enoch Binden who was born on 20th August 1793, the son of Henry and Mary Binden. They had a number of children: Mary baptised on 25th February 1816, Eliza baptised on 20th August 1820, Enoch baptised on 7th September 1823 and Ann baptised on 4th June 1826. The baptism records show that Enoch was a cordwainer (shoemaker). The early land tax records show that Enoch was living in a house owned by Mary Edmonds which we believe to be the 59 St Mary Street. Elizabeth’s husband, Enoch, died on 11th May 1828. He was aged 35 years. Betty became the owner of 41 St Mary Street as a result of the will of Elizabeth Johnson (see above). She must have owned it by 30th September 1834 when she borrowed £50 from George Rolph using the property as security. She borrowed a further £20 from George Rolph in May 1840. We know that Betty Binden was a publican by 1833 as she signed a memorial or petition for clemency for Charity Hogg. The petition gives her occupation as publican, presumably this was the Rose and Crown pub next door. The 1841 census shows Elizabeth as a beer retailer in St Mary Street. She was described as aged 55 living with her children: Enoch Binden, a wheelwright, aged 15 and Ann aged 13 and three other persons: Prudence Rugman a pauper aged 65, Frances Davis aged 7, and Thomas Chapell a housekeeper aged 25. Elizabeth was also listed in several trade directories from 1842 to 1852 as being a beer retailer, although her name varies between Binden, Binder and Bindon. The 1851 census shows Elizabeth still in 41 St Mary Street, now just living there with Ann Files, a general servant aged 12. Elizabeth is not described as having any occupation in that census. Elizabeth’s daughter, Ann, had died aged 17 and was buried on 7th December 1843. Elizabeth was unable to repay the debt and on 31st December 1851 she sold the property to William Cullimore for £56. Elizabeth died aged 75 and was buried on 25th March 1855. William Parker – on 24th June 1858 William bought the property from Thomas Watkins and John Honeyborne. The 1859 and 1862 rate books show that the houses were owned by William Parker. William Parker was described as a gentleman from Frampton Cotterell. The 1861 census shows William was was farmer aged 64 living in Frampton Cotterell. The farm was 57 acres. William is shown as being widowed, but he is shown as living with Louisa Blackmore noted as being ‘Mistress’. Louisa was unmarried aged 28 and had seven children. A family tree shown on the Ancestry website shows Louisa and William never married. She moved in to live with him at Park Farm, Tovey’s Green in 1852. They went on to have 12 children. Eight of the children went to London and started a firm ‘Blackmore Patterns’ in 1895 which they continued running until the 1940’s. William Parker died of ‘senile exhaustion’ in 1876. John Honeyborne – on 25th March 1862 John Honeyborne bought the properties, as a part of a large number of other properties, from William Parker for £400. John was described as a shopkeeper of Thornbury. On 1st June 1959 Austin Walwin Honeyborne sold 41 St Mary Street for £100. The new owners were Donald Walter Pearce, who traded as a butcher at 4 The Plain, and Roland William Pearce of Florence Park, Almondsbury, garage proprietor. By 1965 the house had been demolished and on 30th March 1965, the Pearces sold the land on which 41, 43 and 45 St Mary Street had stood (together with the land on which 33 St Mary Street had stood) to Thornbury Rural District Council for £900. The Council used the land for the erection of a new public library.